The 409A is a 170MHz Four Channel Direct Digital Synthesized Signal Generator in a small table top case. 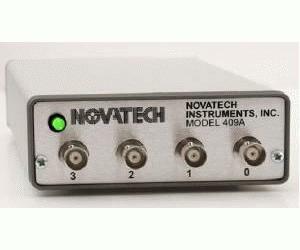 The 409A generates four output signals simultaneously up to 171MHz in 0.1Hz steps under RS232 control. The frequencies of the four outputs can be set independently and can be offset by a controllable phase. The RS232 interface uses simple text commands to control the module and allows non-volatile storage of all settings. The 409A is equipped with a ±1.5ppm on-board VCTCXO clock and can accept an external clock source up to 500MHz. On board RAM allows high speed agile frequency, phase and amplitude modulation and hopping. Up to 32k points can be stored in the Table Mode for arbitrary phase, amplitude and frequency profiles.